Presence of all founding members, be heard and investigated by the Political Bureau, was ignored. In a meeting of the Political Bureau last month a decision was taken by a “majority vote” to go ahead with elections in August, 2016, despite dissenting opinion from Dr. Gerald Gahima, Joseph Ngarambe and Jonathan Musonera to the effect that holding elections without first discussing and resolving the major problems facing the organization would destroy it. Dr. Gerald Gahima resigned from a sham electoral committee which Lt. Gen. Nyamwasa controls. Members of the Bureau of the Executive Committee had not, as practice has been, even had the courtesy to discuss the impending decision on election matters with the Coordinator. Subsequently, they sought but failed to deny him a chance to make his opposition to elections in turmoil known to the meeting of the next Political Bureau meeting. Through the disruptive influence of Lt. Gen. Kayumba Nyamwasa and his Tutsi military allies, and the acquiescence of Hutu elements in the Bureau of the Executive Committee, a proposal for the reformed statute of the organization was deemed unimportant and shelved, without giving a chance to the Executive Committee, the Political Bureau and RNC members to discuss it. Lt. Gen. Kayumba Nyamwasa has now crowned himself the Chairman of the Electoral Commission so that he can decide on the outcomes of the August 2016 elections which, among other things, are intended to expel those with dissenting views and install puppet subordinates over whom he has absolute control. This sad and shameful sequence of events demonstrates that the will of a loud minority, and the silence of a submissive majority, has now become the main driving force, replacing the spirit of debate and compromise that has brought us many achievements in the last five years. 1. We apologize to our members, partners and Rwandans in general that this sad and regrettable state of affairs exists in an organization with a great promise to the Rwandan people and the Great Lakes region. 2. The Rwanda National Congress must now undertake deep reforms to restore its dignity and trustworthiness, under the name the NEW RWANDA NATIONAL CONGRESS (New-RNC); in French, NOUVEAU CONGRES NATIONAL RWANDAIS; and in Kinyarwanda, IHURIRO RISHYA, with exactly the same vision, objectives and strategies as inspired by Rwanda Briefing of August 2010, and enshrined in the RNC Founding Proclamation of 12th December, 2010, and the RNC Thirteen Strategies Policy Document of 2011. 3. A Steering Committee is now established to run the affairs of the New-RNC for a period not exceeding thirty (30) days, within which period the new structures and leadership will be decided upon through consultation. Its members are Dr. Theogene Rudasingwa (Chairman), Joseph Ngarambe (Vice Chairman) and Jonathan Musonera (Secretary). 4. All members of RNC automatically become members of the New-RNC, with all rights and obligations, but each one is free to decide to opt out. All members of the New-RNC will sign the New-RNC Code of Conduct. 5. With immediate effect we are parting with Lt. Gen. Kayumba Nyamwasa, his allies, and all members of the Bureau of the Executive Committee who have submitted to his will. 6. All Chairmen in regions remain in office, but they have seven (07) days during which they have to decide on their affiliation with New-RNC. Mr. Chikuru Mwanamayi is appointed the Chairman of Belgium; Mr.Emmanuel Nshimiyimana the Chairman of Brussels; and Mr. Eric Nkombe the Chairman of France. 7. The New-RNC adopts the new statute as proposed by the committee that was chaired by Dr. Gerald Gahima, pending its discussion within the New-RNC leadership and members. A New-RNC logo will be communicated as soon as possible. 8. There are no elections expected within the New-RNC until further notice, in any case not earlier than 2018. 9. The New-RNC stands by the letter and spirit of all decisions undertaken so far under the umbrella of the opposition platform (FDU-Inkingi, AMAHORO PC, PS-Imberakuri, and PDP-Imanzi), but will temporarily exempt itself from the proceedings of the platform in order to reorganize first. 10. The New-RNC parts with Radio Itahuka, and will therefore not be responsible for its editorial content and activities. The New-RNC will now broadcast through another channel to be communicated as soon as possible. We have not come to the above decisions easily. On the contrary, it has been agonizing months in which we have had to consider the main purpose of our struggle, the interests of our members, and those of our partners and Rwandans in general. 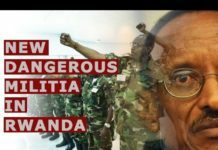 We face a formidable yet declining enemy in the form of President Paul Kagame’s dictatorial regime. President Kagame is armed, rich, dangerous and poised to extend his rule indefinitely in 2017. Our ideas and practice must be such that we face his RPF dictatorship with superior ideas, disciplined practice, and an efficient organization that networks with the whole Rwandan society. However, removing President Paul Kagame from power, though necessary, is not sufficient to justify any means and more sacrifices by Rwandan people unless the pursuit and exercise of power in Rwanda by cliques is uprooted decisively and completely. There is a lot of urgent and difficult work to do immediately that should be our priority. All Rwandans, Africa and the international community have to be mobilized to stop President Paul Kagame from becoming life President in 2017. Rwandans must pool their energies and those of neighbors in the Great Lakes region to prevent another costly regional war through a negotiated, peaceful, political settlement. An international conference on Rwanda, among all Rwandan opposition groups and civil society, must be convened to deliberate on a post-Kagame future on Rwanda, notably on the future of security institutions, truth and reconciliation, democracy with Rwandan safeguards, and regional peace and security. The networks of collaboration and coordination among Rwandan opposition groups and civil society must be strengthened. We must rededicate ourselves to uncovering all crimes committed by RPF in Rwanda and the Democratic Republic of Congo from 1990 until now, shed light on the crimes committed by the MRND regime including those of 1973, and bring to light the crimes committed by MDR PARMEHUTU during its reign. Those involved in shooting down the presidential plane in 1994, killing President Juvenal Habyarimana of Rwanda and President Cyprian Ntaryamira of Burundi, will have to account. In telling the whole truth, and expecting every Rwandan to tell the truth, the aim is not to punish, but to heal and restore from trauma. A general amnesty whose terms will be negotiated with all national stakeholders will provide the necessary framework so that Rwanda may begin to forgive, reconcile, unite and heal at last. We must have the courage to remember together all victims of injustice. That journey must begin with us here, and now. The New-RNC is an umbrella, broad-based organization for all Rwandans to exert pressure and advocate for democratic change through peaceful means. It has to hit the road again running, reforming and reorganizing as it undertakes the tasks before it. It cannot afford to be disrupted by factions, distracted by legalism and bureaucracy, intimidated by militarism, nor tolerate toxic indiscipline especially in the upper echelons of its leadership. The New-RNC must directly reach out to all its members and the whole Rwandan society, by cutting out all bureaucracy, and gradually transform itself into a modern networked organization that is capable of winning by being nimble and agile. Only through a permanent victory of all for all can the true meaning of Rwanda’s political independence be finally realized, the blood of millions of Rwandans atoned for, and the sacrifices of freedom fighters before us retain the catalytic value of creating a free, just, united, peaceful, democratic and prosperous Rwanda.